The warning signs are flashing for shareholders of these three companies. History has shown that dividend-paying stocks outperform non-dividend-payers by a wide margin. In fact, data from Ned Davis Research shows that dividend stocks racked up annual gains of 8.8% compared to only 2.2% for non-dividend payers between 1972 and 2016, which is a remarkable difference. However, just because a company pays a dividend doesn't mean that it's worth owning. After all, if the business is doing poorly, the dividend could be cut, so it's best to avoid buying shares of any company with a dividend that might be in danger. With that in mind, here are three dividend-paying stocks that currently offer up sky-high yields but could be forced to chop their generous dividend payouts in the not-too-distant future. At first glance, you might be attracted to SeaWorld Entertainment's (NYSE:SEAS) dividend yield of nearly 6%. However, if you look below the surface, there are reasons to believe that SeaWorld's dividend is unsustainable and risks being cut in the future. For starters, the company's dividend is currently consuming $0.84 per share each year, and yet that's above this year's earnings estimate of only $0.74. The picture gets even fuzzier when you realize that revenue and earnings have declined over the past two years. Why have the company's financials been heading in reverse? One reason is consumer backlash related to the 2013 documentary Blackfish. The film shined a light on SeaWorld's animal policies and caused a huge public-relations fiasco that led to declining park attendance. If that wasn't bad enough, it's also worth pointing out that SeaWorld is highly leveraged. The company holds more than $1.5 billion in debt compared to only $41 million in cash. If the company can find a way to get its revenue and profits to head back in the right direction, then it may eventually be forced to cut its generous dividend payout. E-commerce giant Amazon.com continues to disrupt the business model of traditional retailers everywhere, which is forcing them to cut prices and increase spending on promotion in response. That's causing margins and same-store sales to decline across the board, and specialty retailers like Pier 1 Imports (NYSE:PIR) are being hit particularly hard. Pier 1's first-quarter results show just how much pressure this company is under. Total revenue fell 4.2% from the combination of net store closings and a 2.5% decline in same-store sales. Management believes that the trend will persist throughout the remainder of the year, which isn't an encouraging sign. Pier 1 is doing its best to keep afloat in this new retailing world. The company is closing underperforming stores and beefing up its marketing spending to bring customers back into the store. However, it's currently unclear whether this plan will work, and the company's profit margins have been trending in the wrong direction over the past few years. 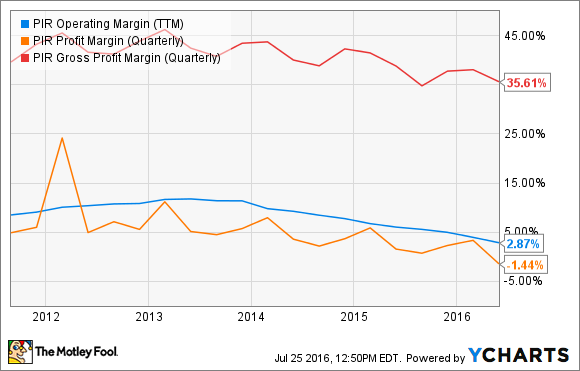 PIR Operating Margin (TTM) data by YCharts. To make matters worse, management has actually been taking on debt to repurchase its shares at "cheap" prices. That factor has now burdened Pier 1 with $200 million in long-term debt, which is nearly double its cash hoard of only $115 million. For 2016, market watchers are projecting that the company will earn about $0.34 per share, which isn't much higher than the $0.28 per share that the dividend currently costs. Looking ahead, analysts project that its earnings will decline by 11% annually over the next 5 years, so it's not hard to imagine that Pier 1 might be forced to cut its generous dividend in order to finance its debt obligations. Is the house finally going to lose? Gaming giant Las Vegas Sands (NYSE:LVS) is currently offering up an eye-popping yield of more than 6%, which might tempt some investors to roll the dice and buy a few shares. However, there is ample reason to approach this stock with a great deal of caution right now. Although it's headquartered in Las Vegas, the company actually generates the majority of its operating profits from its properties in Macau, which is China's gambling Mecca. In good times that's not an issue, but we've recently seen gaming revenue from Macau fall drastically, declining by 9.6% in May. That was the 24th straight month of declines -- a big problem for Las Vegas Sands, as the company has poured billions into building out its presence in Macau. That's saddled the company with more than $9 billion in total debt, and since casino operation comes with huge fixed costs, the loss of revenue on the top line can get magnified on the bottom line. For 2016 analysts are projecting that the company will earn about $2.30 per share, but that should grow to $2.60 next year. Unfortunately, both of those numbers are still well below the $2.88 that it currently spends just to maintain its dividend. Unless Macau starts to turn around, Las Vegas Sands is going to have a hard time maintaining its generous yield. That could hint that a dividend cut would be right around the corner.